It’s that time of year again. Taxes and paperwork. Depending on how your clients have paid you throughout the year, you might get a form 1099-K from Paypal or other processors. Even though it’s been around for a few years now, it still causes a lot of confusion and double reporting can happen when a client wants to file a standard 1099-MISC for what they’ve paid you. Unless paid with cash, paper checks, or direct deposit ACHs, you don’t send a 1099 because all the payment processors like Paypal and even the credit card companies send out 1099-Ks now. Please do not create a 1099-misc for me, because it will create a double report of the income. You paid via Paypal and/or credit card and they send out a 1099-K as a report of payments made for services. I know that’s a little bit confusing, but all the current tax documentation says to only issue 1099-misc to people who were paid by cash, direct deposit, ACH, or check, because payment services and credit card companies are already reporting those payments being made as income. Hope that makes sense and was helpful. What If I Don’t Receive a 1099-K? Here’s where things get a little annoying and frustrating for freelancers and independent contractors like us. To receive an actual print on paper 1099-K you need to have had either $20,000 in income reported through the processor or more than 200 transactions. If this was your first year, maybe you didn’t reach those thresholds. Maybe you have some clients that do pay you by check, so not all of your income is in one place. the income is still reported to the IRS. This is why good record keeping is important. Even without 1099s, you still need to claim your income on your taxes. 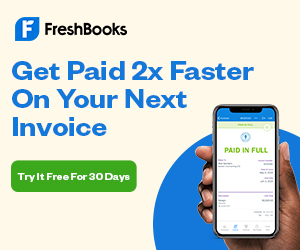 An invoicing and accounting system like FreshBooks, SlickPie, or Wave can help eliminate some of your frustration by showing you at a glance who paid you how much and how they paid it over the course of the year. I know tax time can be frustrating and a little stressful for independent contractors and freelance folks. I hope this has been helpful in sorting out some of the confusion and headaches around the 1099-K.
Love this. Every year I have an issue with this even when I explain it to clients. I’m going to just send them your post.